Do you remember the toys you grew up with? I had a little wooden owl that was simple with bright colors. It did not sing, did not move and maybe you could call it boring? But I call it timeless – it was part of my make believe stories and one person plays and I remember it even today. If you are looking for beautiful toys of yesteryear, look no further. Between Bangalore and Mysore lies a small town called Channapatna. Artisans in this town are keeping their toy making legacy alive today as they work with Maya Organic – an NGO that helps the toy makers earn a decent living from this dying art. 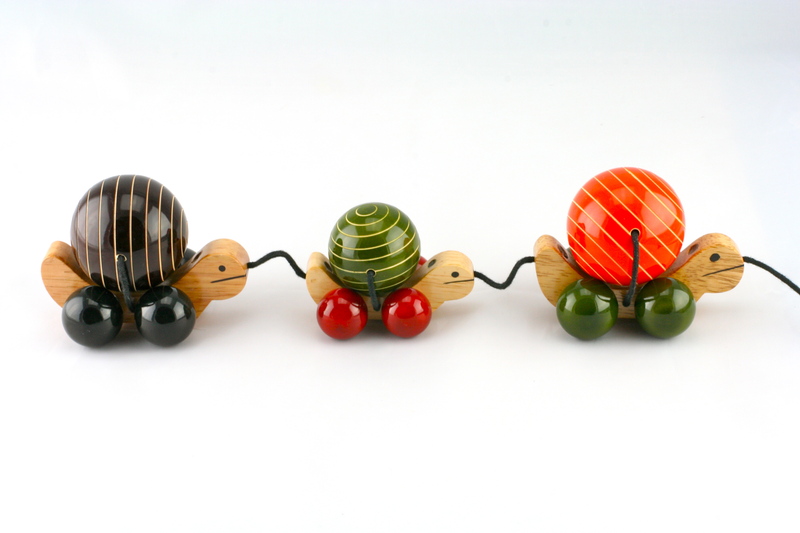 Using renewable hale wood, the artisans hand craft these beautiful toys and color them using natural dyes like turmeric and kum kum. A coloured lac* stick is pressed against the wood while it is turning on the lathe. The lac melts due to the frictional heat and sticks to the wood. Gorgeous, aren’t they? These beautiful toys recently made a splash due to Michelle Obama’s interest during her last India trip. *Lac is an organic non-toxic finish and can be used in food as well as non- food products. It has a tenacious adhesive quality sticking to anything from porous wood to glossy smooth surfaces.